Shafiee, Mojtaba Arekhi, Soheil Omranzadeh, Alireza and Sahebkar, Amirhossein 2018. Saffron in the treatment of depression, anxiety and other mental disorders: Current evidence and potential mechanisms of action. Journal of Affective Disorders, Vol. 227, Issue. , p. 330. Fung, Klint Paterson, Devon and Alden, Lynn E. 2017. Are Social Anxiety and Loneliness Best Conceptualized as a Unitary Trait?. Journal of Social and Clinical Psychology, Vol. 36, Issue. 4, p. 335. Young, Alys Rogers, Katherine Davies, Linda Pilling, Mark Lovell, Karina Pilling, Steve Belk, Rachel Shields, Gemma Dodds, Claire Campbell, Malcolm Nassimi-Green, Catherine Buck, Deborah and Oram, Rosemary 2017. Evaluating the effectiveness and cost-effectiveness of British Sign Language Improving Access to Psychological Therapies: an exploratory study. Health Services and Delivery Research, Vol. 5, Issue. 24, p. 1. Kasper, Siegfried Volz, Hans-Peter Dienel, Angelika and Schläfke, Sandra 2016. Efficacy of Silexan in mixed anxiety–depression – A randomized, placebo-controlled trial. European Neuropsychopharmacology, Vol. 26, Issue. 2, p. 331. O’Connor, Suzy Ferguson, Eamonn Carney, Terri House, Emma and O’Connor, Rory C. 2016. The development and evaluation of the paediatric index of emotional distress (PI-ED). Social Psychiatry and Psychiatric Epidemiology, Vol. 51, Issue. 1, p. 15. Möller, Hans-Jürgen Bandelow, Borwin Volz, Hans-Peter Barnikol, Utako Birgit Seifritz, Erich and Kasper, Siegfried 2016. The relevance of ‘mixed anxiety and depression’ as a diagnostic category in clinical practice. European Archives of Psychiatry and Clinical Neuroscience, Vol. 266, Issue. 8, p. 725. Strand, Jennifer Goulding, Anneli and Tidefors, Inga 2015. Attachment styles and symptoms in individuals with psychosis. Nordic Journal of Psychiatry, Vol. 69, Issue. 1, p. 67. Prazeres, Filipe and Santiago, Luiz 2015. Prevalence of multimorbidity in the adult population attending primary care in Portugal: a cross-sectional study. BMJ Open, Vol. 5, Issue. 9, p. e009287. Gore, Whitney L. and Widiger, Thomas A. 2015. Assessment of dependency by the FFDI: Comparisons to the PID-5 and maladaptive agreeableness. Personality and Mental Health, Vol. 9, Issue. 4, p. 258. Voronova, E. I. 2015. The systematics of psychogenic depressions (reactions of complicated grief). Zhurnal nevrologii i psikhiatrii im. S.S. Korsakova, Vol. 115, Issue. 12, p. 31. Dillon, Daniel G. Rosso, Isabelle M. Pechtel, Pia Killgore, William D. S. Rauch, Scott L. and Pizzagalli, Diego A. 2014. PERIL AND PLEASURE: AN RDOC-INSPIRED EXAMINATION OF THREAT RESPONSES AND REWARD PROCESSING IN ANXIETY AND DEPRESSION. Depression and Anxiety, Vol. 31, Issue. 3, p. 233. Newby, Jill M. Mewton, Louise Williams, Alishia D. and Andrews, Gavin 2014. Effectiveness of transdiagnostic internet cognitive behavioural treatment for mixed anxiety and depression in primary care. Journal of Affective Disorders, Vol. 165, Issue. , p. 45. Braam, Arjan W. Copeland, John R.M. Delespaul, Philippe A.E.G. Beekman, Aartjan T.F. Como, Ariel Dewey, Michael Fichter, Manfred Holwerda, Tjalling J. Lawlor, Brian A. Lobo, Antonio Magnússon, Hallgrímur Prince, Martin J. Reischies, Friedel Wilson, Kenneth C. and Skoog, Ingmar 2014. Depression, subthreshold depression and comorbid anxiety symptoms in older Europeans: Results from the EURODEP concerted action. Journal of Affective Disorders, Vol. 155, Issue. , p. 266. Shorter, E. and Wachtel, L. E. 2013. Childhood catatonia, autism and psychosis past and present: is there an ‘iron triangle’?. Acta Psychiatrica Scandinavica, Vol. 128, Issue. 1, p. 21. Michail, M. and Birchwood, M. 2013. Social anxiety disorder and shame cognitions in psychosis. Psychological Medicine, Vol. 43, Issue. 01, p. 133. Malhi, Gin S and Henderson, Scott 2013. The anxiety of separation? Partitioning depression and anxiety in DSM-5. Australian & New Zealand Journal of Psychiatry, Vol. 47, Issue. 11, p. 986. Ohaeri, Jude U. and Awadalla, Abdel W. 2012. Characteristics of subjects with comorbidity of symptoms of generalized anxiety and major depressive disorders and the corresponding threshold and subthreshold conditions in an Arab general population sample. Medical Science Monitor, Vol. 18, Issue. 3, p. CR160. Faravelli, Carlo Castellini, Giovanni Benni, Laura Brugnera, Andrea Landi, Monica Lo Sauro, Carolina Pietrini, Francesco Rotella, Francesco and Ricca, Valdo 2012. Generalized anxiety disorder: is there any specific symptom?. Comprehensive Psychiatry, Vol. 53, Issue. 8, p. 1056. George, Christina Kanakamma, Libu Gnanaseelan John, Jacob Sunny, Ginesh Cohen, Alex and De Silva, Mary J 2012. Post-tsunami mental health: A cross-sectional survey of the predictors of common mental disorders in South India 9-11 months after the 2004 Tsunami. Asia-Pacific Psychiatry, Vol. 4, Issue. 2, p. 104. Andrews, G., Stewart, G., Morris-Yates, A., et al (1990) Evidence for a general neurotic syndrome. 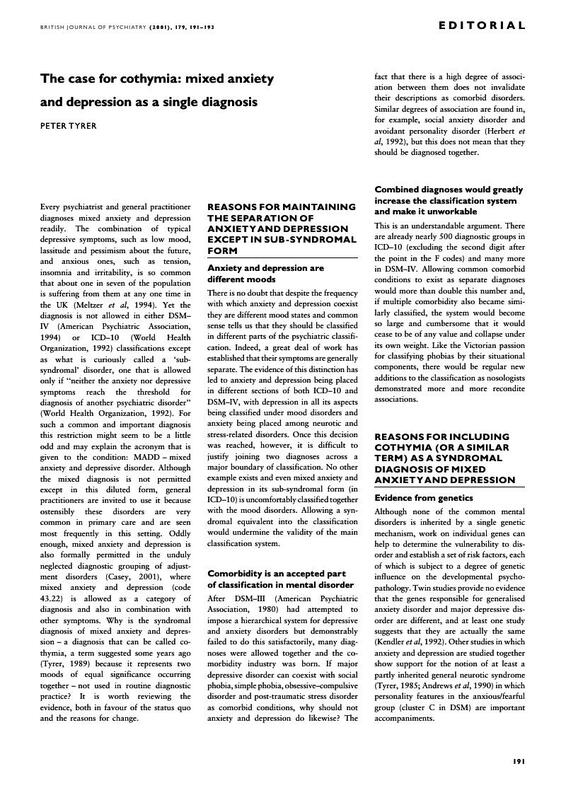 British Journal of Psychiatry, 157, 6–12. Casey, P., Do wrick, C. & Wilkinson, G. (2001) Adjustment disorders: fault line in the psychiatric glossary British Journal of Psychiatry, in press. de Vry, J. (1995) 5-HTIA receptor agonists: recent developments and controversial issues. Psychopharmacology 121, 1–26. Emmanuel, J., Simmonds, S. & Tyrer, P. (1998) Systematic review of the outcome of anxiety and depressive disorders. British Journal of Psychiatry, 173 (suppl. 34), 35–41. Jacob, K. S., Everitt, B. S., Patel, V., et al (1998) The comparison of latent variable models of non-psychotic psychiatric morbidity in four culturally diverse populations. Psychological Medicine, 28, 145–152. Lenzi, A., Lazzerini, F., Marazziti, D., et al (1993) Social class and mood disorders: clinical features. Social Psychiatry and Psychiatric Epidemiology 28, 56–59. Meltzer, H., Gill, B. & Petticrew, M. (1994) OPCS Surveys of Psychiatric Morbidity in Great Britain. Bulletin No. I: The Prevalence of Psychiatric Morbidity among Adults Aged 16–64, Living in Private Households, in Great Britain. London: OPCS. Robbins, T. W. (1997) Arousal systems and attentional processes. Biological Psychology, 45, 57–71. Seivewright, H., Tyrer, P. & Johnson, T. (1998) Prediction of outcome in neurotic disorder: a five year prospective study. Psychological Medicine, 28, 1149–1157. Tyrer, P. (1989) Classification of Neurosis. Chichester: John Wiley & Sons. World Health Organization (1992) Tenth Revision of the International Classification of Diseases and Related Health Problems (ICD–10). Geneva: WHO.